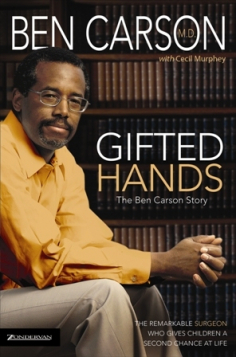 Gifted Hands – The Ben Carson Story by Ben Carson, M.D. with Cecil Murphey. Gifted Hands is the inspiring story of an inner-city kid with poor grades and little motivation, who at age thirty-three, became director of pediatric neurosurgery at Johns Hopkins University Hospital. Gifted Hands will transplace you into the operating room to witness surgeries that made headlines around the world, and into the private mind of the compassionate, God-fearing physician who lives to help others.